It is our role as the NGO to highlight and promote a people’s process – and the upgrading of Sheffield Road is exactly that. At each milestone there were amazing glimpses and examples of how peoples’ lives were transformed by the upgrade, also how these people took on responsibility to encourage others to come on board. The dynamics in the community told a story and a justifiable story as well – how they resisted the one-size-fits-all approach, how it took them time to understand the idea of blocking out. To talk of ISN and CORC in the same vein, as if they are both the same side of the same coin – this diminishes the idea of a people’s process. It is important to mention and showcase how this process from the first engagement with the City right up to now has been an immense learning curve for both the social movements and for CORC staff. Initially everyone, more especially the NGO staff, were not clear as to what informal settlement upgrading was all about. The Joe Slovo blocking out set a very important precedent for the entire SA alliance and realigned our focus. Up until this point the alliance had not redirected its focus towards informal settlement upgrading. Joe Slovo blocking was a critical turning point for the alliance. 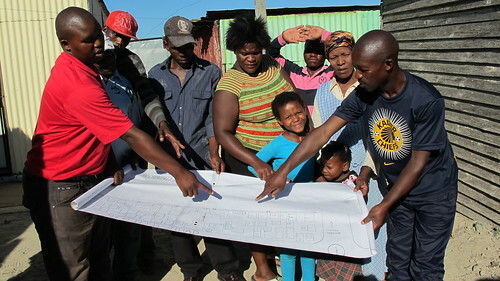 As a result of the blocking out and the precedent that was set, the Informal Settlement’s Department were keen to meet with those responsible for the blocking out. This initial meeting brought all the parties together and initiated the idea of working on pilot projects with the City. 17 March – City official comes to Joe Slovo to meet with Joe Slovo leadership & Ikhayalami. 1 April – First meeting with the City – agreed to look into the possibility of doing some joint pilot projects together – however what ISN, CORC and Ikhayalami had in mind was not the same as what the City had in mind. As an alliance we were hoping to focus on Informal settlement upgrading with regard to the reconfiguration of the layout of settlements plus the provision of services. What the City had in mind was what they referred to as Informal Settlement Improvement – i.e. only basic services. Due to elections and Easter the next meeting to take things forward was the 27 May. 27 May meeting with the City – further discussion around what was actually feasible with regard to working with the City who stressed basic services as an entry point. It was agreed that the City would set out their criteria for pilot projects as would ISN and that both parties would share this information prior to the next meeting. It was also agreed that ISN would identify a number of potential pilot project to present to the City at the next meeting. • age of settlement – i.e. not relatively new. Our criteria were the exact opposite except for well organised communities. We also had the presence of saving schemes as a possible criteria. June – In spite of the City’s criteria after ISN’s presentation all 11 pilot sites were accepted as part of the joint pilot projects. September – at a general meeting in Sheffield Rd ISN introduced themselves as did CORC and Ikhayalami. The possibility of working with Sheffield Rd, the City and ISN was proposed. The community accepted the idea of being one of the pilot projects. ISN suggested the establishing of a projects committee – people were nominated and appointed at the meeting. In addition as an after thought the existing settlement leadership was incorporated into the project committee, collectively comprising 13 people. October – At a second general meeting in Sheffield Rd, ISN and Alliance present the idea of blocking out Sheffield Rd. A series of exchange visits are set up to see the blocking out in Joe Slovo. Until March – Engagement at settlement level about the concept of blocking-out, community contribution and savings. Saving scheme grows in numbers but not a big uptake for contributions for blocking out. 5 people in Sheffield Rd show significant commitment to the blocking out idea and collectively contribute R2 000 into the saving scheme. The rest of Sheffield Rd is not as committed, rather wanting to see things happen before they contribute. After numerous engagements with the community, it was agreed that where possible, shacks maintain their current size in the new configuration, shack sizes range from 7sqm to 40sqm. April – A visiting architect draws a master plan with a lane of 3m that runs throughout the settlement and two ‘site’ options of between 15sqms and 24sqms, a divergence from what the community had in mind . ISN take this further and translate this into a one-size-fits all in line with the precedent that was set in Joe Slovo. This backfires to the point where there is wide scale dissatisfaction and disillusionment especially amongst those families in shacks bigger than 15sqm. Households less than 15sqm support the approach. This led to division in the community. Late April – need for a total rethink on how to go forward. A realisation that some shack owners are blatantly resisting the blocking out idea. Another realisation that as ISN and the NGO’s trust needs to be rebuilt and that there is a need to retract and adhere to what the community first agreed upon – current shack sizes need to be considered and incorporated into the blocking out design. 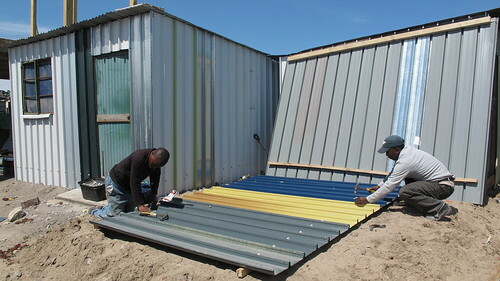 In addition, many households are refusing to take part and as such an audit into which shacks are in good condition and don’t necessarily need to be upgraded was necessary so that we could use these shacks as anchor points and design around them. The idea was to rebuild trust and then start working at the cluster level. UCT Planning and Architecture Department was approached to assist in this study and with plans for blocking-out. First thing they recommend is that the proposed 3m lane in the master plan be abandoned as it utilises too much valuable space in a small settlement of only 17m wide. May – UCT, residents of Sheffield Rd, CORC and Ikhayalami go shack to shack assessing whether people are in favour of blocking out, if they would rather keep their existing shack, the quality of the shack and which households operate businesses from their shacks. Two general meetings that were called by the project committee – to restore faith in the blocking out concept – that shack size will be taken into account in the blocking out and to show the findings of the analysis done with UCT – drew little interest. At the second general meeting those present agreed that the project’s committee and NGO could work at cluster level. June – Identified a cluster were the majority of the shelters were of poor condition, all were of varying sizes. One shack in the cluster was in good condition and did not need to be upgraded. This cluster was chosen to demonstrate all possibilities for blocking out. A series of engagements with the cluster began. Shack sizes were taken into account, a model of the existing cluster was built, individual shack models were made for the residents to reposition on the cluster map. Residents were excited about the prospect of blocking out – but savings towards this was not forthcoming. Word spread in the settlement that people’s shack sizes would be taken into account. July – the formation of an ISN pilot team to work in Sheffield Rd on a day-to-day basis. Gogo Rose in first who had saved R500 towards the blocking out became vocal that the blocking out should start with her shack. Focus shifted to Gogo’s area where it was agreed that if her two neighbours contributed, then we would re-block 3 shacks as a start. The ISN pilot team engaged both tiers of leadership in an attempt to unify them and then engaged other families near Gogo. August – Gogo encourages others in her area to contribute and goes door to door with her savings book to collect contributions. At a cluster meeting the residents negotiate a 50% contribution prior to blocking out rather than the 100%. September the 14th – first shack gets dismantled followed by 2 others. Then 3 shacks that had a small courtyard dismantled their shacks which were rebuilt in a straight line. This did not take into account the important idea of a courtyard. Discussions around this ensued. It took 3 days for all in the cluster to agree to shift the 3 shacks and recreate a bigger courtyard. Once this was done two more shacks were dismantled and rebuilt. October – A family in 40sqm shack refused to take part in the blocking out. This shack stood in the way of the cluster being blocked out as it stood at the entrance and stood in the way of other shacks being able to be blocked out. Reasons for not wanting to take part – owner of the shack did not live in Sheffield Rd, those living in the shack were unemployed. After a difficult period of negotiation the project committee and ISN convinced the woman to come on board. 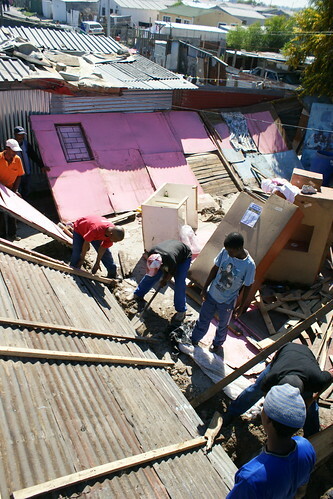 December – 40sqm comes down as well a number of other shacks – all get blocked out in a better layout. Five toilet cement booths get delivered to site and placed were the community has identified. February – 23 shelters blocked out in Sheffield Rd. Both the projects’ committee and original committee are working hand in hand and driving the process with ISN pilot project support.